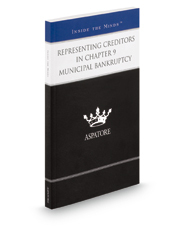 Representing Creditors in Chapter 9 Municipal Bankruptcy provides an authoritative, insider's perspective on the statutory framework that allows municipalities to reorganize under the Bankruptcy Code. Written by partners from some of the nation's leading law firms, this book guides the reader through the basic principles and factors that creditors' attorneys and clients must understand and evaluate in order to best defend their rights under the Code. These top lawyers analyze the intricacies of notable Chapter 9 cases, e.g., from City of Detroit and Jefferson County to City of Vallejo and Orange County, and predict what entities may seek Chapter 9 protection in the future. Finally, these leaders discuss the role of the bankruptcy court in Chapter 9, tips for working effectively with creditors of municipal debtors, and the future of Chapter 9 legislation. The different niches represented and the breadth of perspectives presented enable readers to get inside some of the great legal minds of today, as these experienced lawyers offer up their thoughts on the keys to success within this dynamic field.